Product prices and availability are accurate as of 2019-04-11 05:05:30 EDT and are subject to change. Any price and availability information displayed on http://www.amazon.com/ at the time of purchase will apply to the purchase of this product. The Barbados cherry is a large, densely branched shrub. If pruned it will form a central trunk and can grow as a small tree. It varies in shape from a low and spreading habit to a more upright and open habit with slender branches. Shiny light to deep evergreen leaves will vary in size from 1 to 3 inches and are rounded in shape. The small, attractive flowers range in color from pale pink to rose. They usually start to appear in April in our area and flowering will continue throughout the summer and sometimes into the fall. Soft, juicy, thin-skinned Barbados Cherry fruit are light red to deep crimson when mature. The outer shape somewhat resembles a small apple, but inside the fruit are several very un-apple like seed. The fully mature fruit average about an inch in diameter. 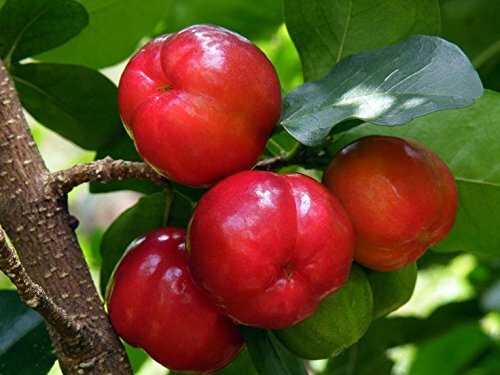 Barbados cherries are borne in leaf axils, singly or in clusters of 2 or 3. The shrub may have 3 to 5 crops per year, from May to November, with the largest crops appearing during the summer. In frost-free areas it is almost everbearing. The fruit is rather tart but some selections are sub-acid to almost sweet. Inside, the flesh is yellow-orange and very high in vitamin C (ascorbic acid). The Vitamin C content of one fruit ranges from 1000 to 2000 mg per 100 grams of edible fully ripe fruit. More acid fruit has higher vitamin C content, and the amount of this compound is much higher in partially ripe fruit. Sometimes a single Barbados Cherry fruit can supply the daily adult requirement of vitamin C.